After the spec’d-out One X and One X+ failed to make the desired impression on an Android user base concerned primarily with Samsung-branded handsets, HTC is back with a new flagship device, and is doing its level best to gather some momentum behind it. The HTC One, which has been the subject of quite a few carefully-engineered leaks, is going to be showcased very, very soon – on February 19th, in fact – and in anticipation for its special launch event in New York City on that very date, the ‘quietly brilliant’ Taiwanese manufacturer has been running special promo page (complete with a countdown timer) on its Web page. 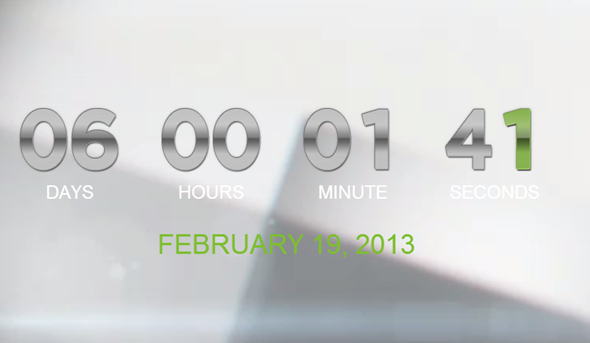 Although the HTC One isn’t a confirmed moniker of the upcoming handset, the fact that any time ending in the number “1″ on the countdown timer results in the flashing of said number in green, would seem a fairly strong indicator that the device will, in fact, be called the HTC One. The green flashing isn’t particularly exciting in itself, but HTC also reveals blurred outlines of what we can only presume to be the actual device. The sneak previews seem to correlate with what we have seen of the device through leaks thus far, but all will become clearer on 19th. Companies tend not to run such countdowns many days prior to the launch of a new device, but HTC certainly needs to generate some hype having been crowded out contention by a slew of Samsung devices. As per the leaks and murmurs, it looks as though there will be more focus on build quality on the HTC One, with a great deal more metal used in its construction than you generally see with Android handsets. The so-called “Ultrapixel” camera may also be a feature, and with Nokia’s PureView proving to be a great deal more than just a gimmicky tag line, HTC fans will be hoping for a supreme snapper when the device eventually does begin shipping. We will have all of the features of the HTC One’s launch event on February the 19th, which takes place in New York City, so stay tuned to our coverage here at Redmond Pie!